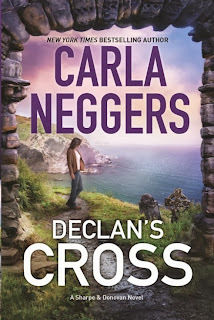 The Sharpes and Donovans are back in the 4th installment of the Sharpe & Donovan series by Carla Neggers with more adventure, romance, and murder, this time in the beautiful lush and rolling hills of Ireland! Broken-hearted and seeking to unknowingly run away from her troubles, Julianne Maroney, a marine biologist, jumps at the chance to partner with Lindsey Hargreaves, an exciting yet flighty adventure seeker who's daughter to the wealthy founder of the Hargreaves Oceanic Institute, when she offers her a position to take part in Lindsey's newest project while passing through Julianne's town of Rock Point, Maine. She didn't have to think twice; with the 'mad money' her grandfather gave her before he died, she booked her tickets to Declan's Cross, Ireland and was off the next week! As soon as Julianne lands, trouble ensues. Lindsey, who was suppose to pick her up at the airport bright and early, never arrived and nobody's heard from her in the past day or two. At first her friends, colleagues, and even her father chalked it up to her being flighty. That is until Julianne stumbles upon Lindsey's dead body, bruised and broken, at the bottom of a rocky seaside Irish cliff. Good thing FBI agents Emma Sharpe and Colin Donovan are "conveniently" in town to look into matters! Unfortunately to Julianne who's trying to escape a Donavon, she resents their presence as much as she appreciates it. Murder, greed, and mystery follow Julianne's arrival to the small town of Declan's Cross and with only a few weeks until all three of the Americans have to leave back for Maine, the time is ticking to find and stop a cold-blooded killer. I've been reading Carla Neggers for at least 6 to 7 years now! I remember bonding over her books with my aunt while vacationing up at her Northwood's cottage for the summers when I was around 15 or 16, so needless to say, I'm quite a big fan! 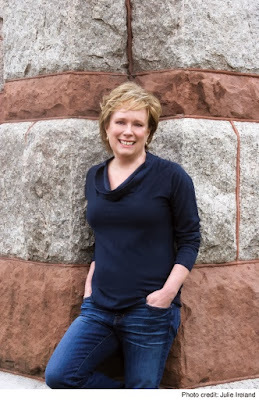 I was beyond thrilled to be given the opportunity to review Carla's newest book in her Sharpe & Donovan series, Declan's Cross. Even though I haven't read any of the previous 3 books in the series, I still eagerly accepted the opportunity! Of course going into it there were several pieces of information I didn't have having not read the other books, but after a few chapters I had pretty much got my bearings and was able to enjoy reading without confusion, which I will admit, I was worried about. 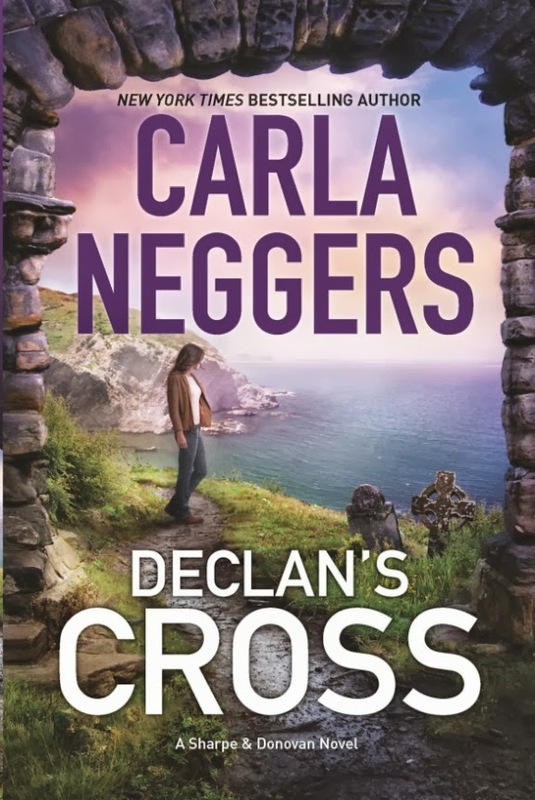 I've always been a fan of Carla's 'Author Voice,' or style of writing, so reading Declan's Cross was like cuddling up with a comfy blanket; it was familiar and I settled into reading the book right off the bat! There are only two complaints I have with her newest book: It seemed to be quite repetitive, thankfully more so in the beginning couple of chapters then throughout the entire book, as well as the book wasn't as action/adventure packed as some of her earlier releases like The Rapids or Stonebrook Cottage; I'm one that thrives off the action/adventure so that was a little disappointing. All in all however, I found Declan's Cross to be an easy and enjoyable read from one of my favorite authors and I definitely plan to read the previous books in the series. I've already bought a copy of Saint's Gate that's just waiting on my bookshelf to be started! You can purchase Declan's Cross on Amazon or Barnes and Noble. Good job there girlfriend! That sounds like one helleva book you got there. If I was into that type of story I would grab it for sure, but being as reading puts me to sleep every darn time I have to watch what I pick, but I'm sure that readers would appreciate your effort here. I don't know if you know Cheryl over at Cmash loves to read I believe it's called; she's in the hospital having gallstones & gallbladder taken out. Please a few prayers for her I'd appreciate it. She's a good friend of mine. She has real bad back problems too & its a dam shame this happens to her too! Thanks.